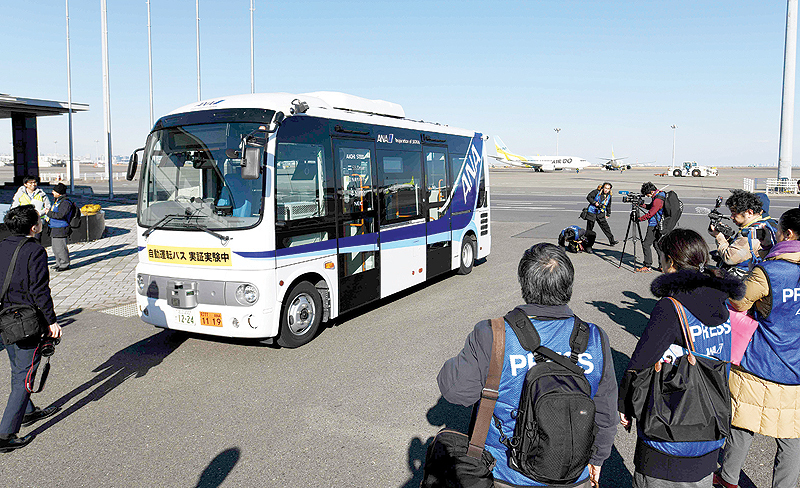 TOKYO: Visitors pouring into Japan’s Haneda airport for the Tokyo Olympics next year may find themselves ferried to and from planes on driverless buses, currently being tested at the major hub. Six Japanese firms, including national carrier ANA, jointly started a 10-day experiment with a self-driving prototype minibus last week. On Tuesday, officials allowed a sneak peak at the automated transportation, which is being tested with a safety driver in the front seat. The “driver” sat with his white-gloved hands hovering above the wheel, ready to take control if need be, but otherwise allowing the bus to wend the route on its own. “Our hope is to be able to offer users autonomous buses by the Tokyo 2020 Olympics,” said ANA project chief Tadakatsu Yamaguchi. The vehicle holds a maximum of 10 people and cruises along a route connecting two terminals at a speed of up to 30 kilometers (19 miles) per hour using GPS and magnetic markers on the road. Project officials did not immediately detail the cost of the system or how many people they expect to eventually transport with the buses. Japan is hoping the 2020 Games will be a chance to showcase cutting edge tech projects in the country, but autonomous transport is also an important sector for a nation suffering labor shortages and a shrinking, ageing population.